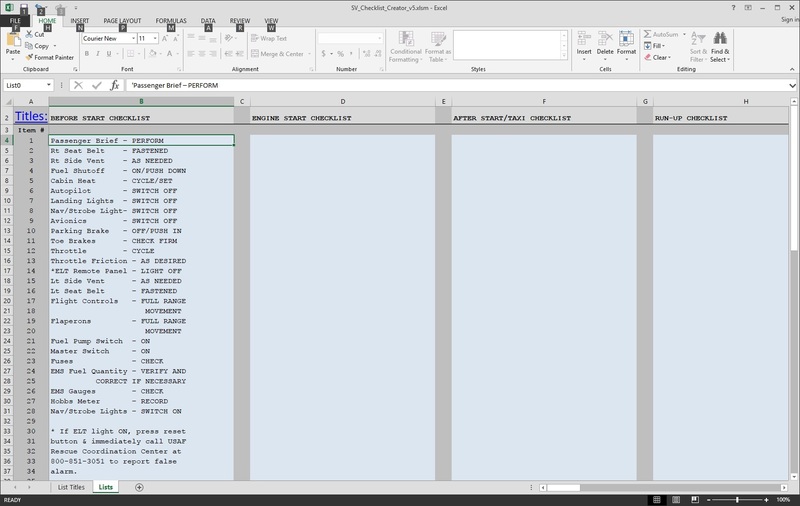 When Dynon’s creator tool is launched, the user will see an Excel spreadsheet pop up that is split into two frames. The frame on the left has a tab on the lower left called “List Titles”. The frame on the right is an instruction window that tells the user about how to use the creator tool and at the bottom of the instruction window is a “SAVE” changes button to click on after all the desired checklist entries have been made. Moving back to the left frame… at the top of the “List Titles” frame is a heading of “Checklist Titles” and below that are “List” lines labeled 0-23 … this is where the title for each checklist list (the first line of all my text lists) is entered. To the right of each "List" line is an associated “Edit” link. Clicking on the associated “Edit” link will take the user to the appropriate spreadsheet cell that will contain the actual checklist text that will be displayed by the SkyView … this is where the text from my checklist/info text lists beginning with the second line thru the last line will be stored. Note that clicking on the “Edit” link takes the user away from the “Checklist Titles” frame. To get back to the “Checklist Titles” frame so the next checklist title can be entered, just click on the “List Titles” tab on the bottom left of the spreadsheet page. Screenshot of the Dynon’s Excel-based checklist creator tool as one would see it when first launching the tool. Note the layout … the List Titles tab is active and is the location for your custom checklist titles to be placed into the List lines 0-23. As can be seen here the “Checklist Titles” lists have seen populated with checklist titles I typed into the spreadsheet creator. Note the first title in List 0 is the Before Start Checklist. The next screenshot will show what happens after clicking the “Edit” tab to the right of the Before Start Checklist entry. It opens the appropriate cell in the spreadsheet where the checklist text is to be entered. 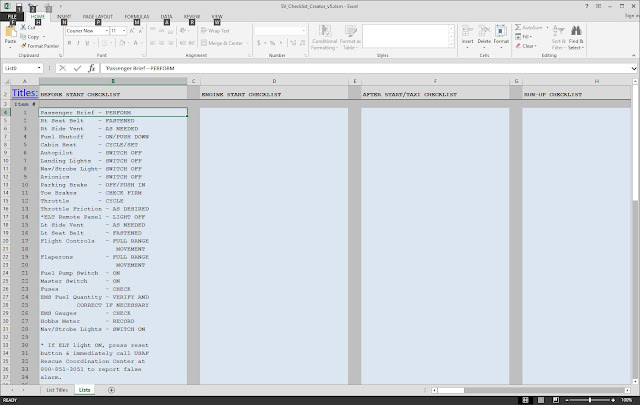 This is where one would paste the desired text list (line 2 to the last line) into the top location in the cell which is denoted as Item 1 and has a green box. Pasting the list into the green box will populate the rest of the items below automatically … the result of which one can see in the screenshot below. To enter the next checklist title, click on the “List Titles” tab on the bottom left of the window and the” List Titles” frame will appear again. As can be seen in this screenshot, after clicking on the “Edit” link to the right of the Before Engine Start title entered in list 0, the appropriate storage location or cell in the spreadsheet opens. Pasting the text list into the green box that appears at Item 1 will yield the results that can be seen in this photo. 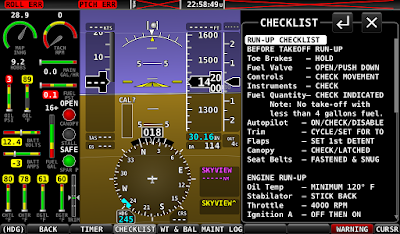 To get around the limitations of the checklist creation tool requiring one massive typing session, I began working on creating and honing checklists for the DOG Aviation RV-12 using a text editor and saving each check list as a separate file … the contents of which have been posted in Parts 3-7. The thought being, I could take my time making the lists and adjusting them to my liking ... then when finished, all that would be necessary to do is copy and paste the contents of each file into the appropriate locations in Dynon’s checklist creator tool and click the save button. Piece of cake. Before beginning the copy and paste process, I found it much less confusing to remove the text Dynon provides as samples for the checklist titles in the checklist creator tool. Also some cells have example checklists as well, so prior to pasting into those cells, one can delete the entries for each item by clicking on the item and pressing the delete key on the keyboard or right clicking the mouse and select “clear contents” from the pop up menu. Note: When pasting text into the checklist creator tool, suggest using a right click of the mouse and selecting paste -match destination formatting. As mentioned earlier, my text lists were created as follows: The first line in each text list is the “Title” of the checklist or information list and needs to be copied and pasted into the “Checklist Titles” page beginning at list 0. Next, the second line and all remaining lines of my text lists need to be copied and pasted into the associated spread sheet location … (done by clicking on the “Edit” link adjacent to the current Checklist Title being entered). 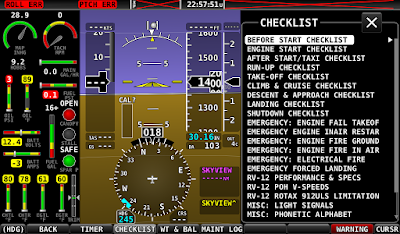 As an example, my first two check lists are titled “Before Start Checklist” and “Engine Start Checklist”. The way the process works with my text lists is: Copy the first line of “Before Start Checklist” (which is the title line) and paste it into “Checklist Titles” - List 0 cell in the Dynon checklist creator. Next click on the “Edit” link to the right … this will open the associated cell where the actual checklist text will be stored. Now copy the REMAINING lines of the “Before Start Checklist” (second line thru to the end of the text list) and paste the text into the open spreadsheet cell where the green box is on Item 1 … the list should populate the cell. To enter the next checklist, click on the List Titles tab at the bottom left of the spreadsheet to get back to “Checklist Titles” so the next checklist title can be entered. Now copy and paste the first line of the “Engine Start Checklist” into Checklist Titles - List 1 location and click on the “Edit” link to the right to open the associated spreadsheet cell for the actual checklist. Copy the REMAINING lines of the “Engine Start Checklist” (second line to the end of the text) and paste it into the open spreadsheet cell where the green box is on Item 1 … the list should populate the cell. Repeat the process until all the desired lists of text have been entered into the checklist creator tool. When done entering all the text for the checklists and desired informational lists, click on the “Save changes Click Here” button and name the file with a .txt extension with no spaces in the file name … something like RV-12checklist.txt will work nicely. To install the newly created checklist file in the Skyview, follow the file loading procedure discussed near the end of the Part 1 post. 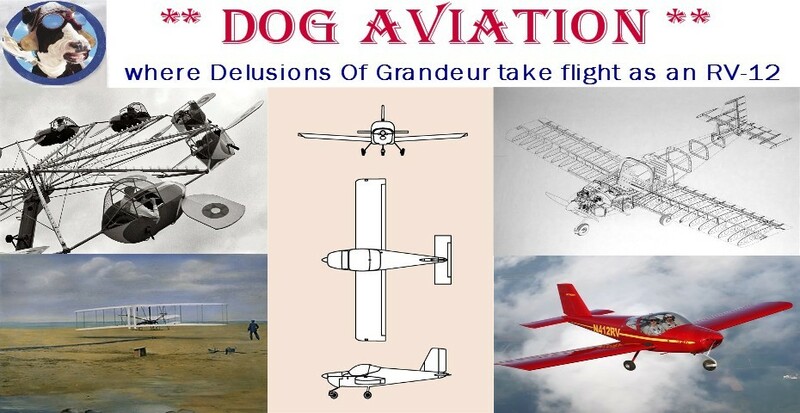 Oh, for what it is worth, after posting the checklist text on the DOG Aviation Blog the posted checklist text was extracted from Posts 3-7 on the the Blog and used to create my checklist file after copy/pasting all the text into the Dynon checklist creator tool. Took a little less than 30 minutes of repetitive copy & pasting and I had a working checklist file that I took to the airport earlier this evening and loaded into the SkyView. 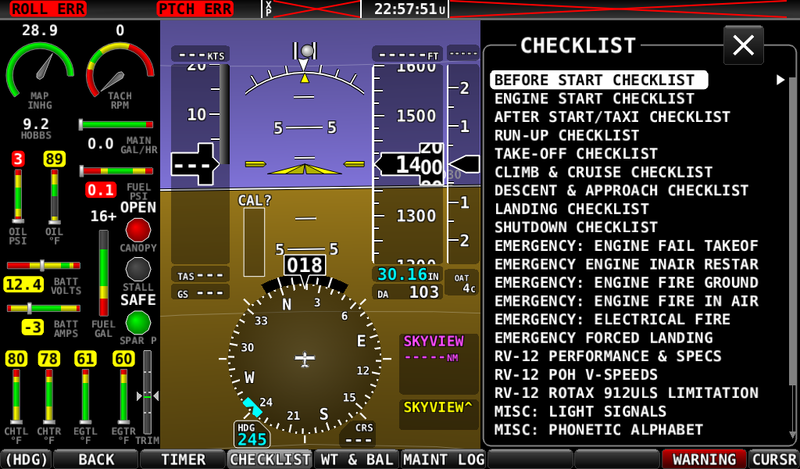 All went well and below are a couple of screenshots taken after installing the newly created checklist file in the Dynon SkyView. Screenshot of the main checklist menu ... this is what appears after pressing the Checklist button in the Tools menu. 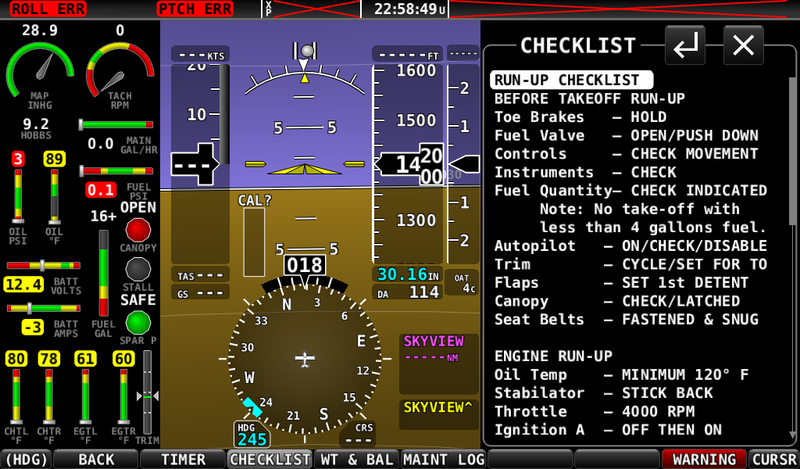 This is an example of what the 31 character max Run-Up checklist looks like displayed at 40% on the Skyview. As one can see in the above two screen shots ... I’ve verified the transfer process described above truly works as typed and the text lists posted in Parts 3-7 really will create usable checklists without any bumps in the road when pasted into Dynon's checklist creator tool . Admittedly, this project took a lot of typing, but the results were worth the effort. Of course, using the posted text lists in Parts 3-7 will save a ton of time for those inclined to enter checklists in their SkyView but did not want to take the time to do all the configuring from scratch.